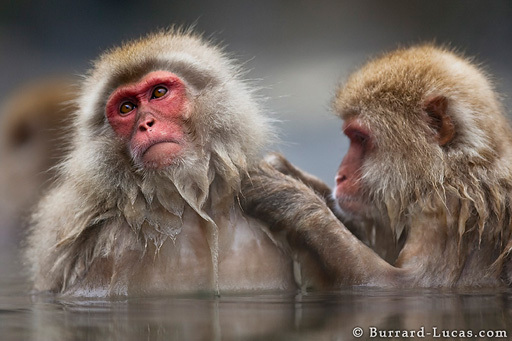 Japanese Macaques, also known as "Snow Monkeys", are found high up in the mountains of Japan. They live further north than any other non-human primate and survive winter temperatures of less than -15°C. The monkeys of Jigokudani Yaenkoen have learnt to bathe in naturally heated volcanic hot springs and throughout the day they can be seen swimming, playing and relaxing in the steaming waters! These macaques were grooming each other. Grooming plays an important role in cementing relationships within the group.